Do you like stir fried food and want to cook it at home with minimal equipment? Are you afraid of trying out stir fry recipes because you don’t own a wok? Do you hate cooking with a wok, because the smoke sets off your fire alarm all the time? If you answered yes to any of these questions, this article will be very helpful to you. No matter whether searching on the internet or browsing through cookbooks, the word “wok” will jump out every time. Everyone seems to claim it’s necessary to own a wok and that using a wok is the only way to cook good stir fried food. Well, I really doubt that. Don’t get me wrong. I grew up in China and my family uses a wok to cook every day. I know how to use a wok and I do like to make stir fry with it. However, I prefer to use my heavy bottom nonstick frying pan to cook most of the stir fried dishes on a daily basis. Below are the 10 reasons you should use a frying pan to make stir fried dishes instead of a wok. A wok might not be expensive. But why buy it and take up space to keep it in any case, if you can create stir fried food with the kitchen wares you already have? You should also consider the extra equipment you have to purchase with the wok, which includes a metal turner, a wok lid, and a wok ring (if you use the traditional round bottom wok). A standard cast iron wok will get rusty if you don’t use it over time. You have to rub it with oil regularly to keep it in good shape. Chances are, when you finally decide to cook a stir fried dish and go to the garage to fetch the wok, it is already unusable. A frying pan can generate great stir fried dishes, too. I won’t say you could replicate 100% of dishes using a frying pan to get the exactly the same result, as you’d get using a wok. But you can make delicious and authentic stir fried dishes with a frying pan. If you look at the black pepper steak or fish fragrant eggplant, you will find that a frying pan can create authentic Chinese stir-fry easily. You will only need half or even one third the oil if you’re cooking stir-fry with a nonstick frying pan. Believe me, even if you heat the wok very well and follow all the instructions from the cookbook, certain items will still stick to the wok and get burnt. Moreover, not all stir fry requires a super high oil temperature. You could easily handle with them with a non-sticky frying pan and use much less oil. Try to cook vegetable and ham fried rice with a wok, and you will be surprised how much oil you’ll need to use to keep the rice from sticking to the wok. If you’re worried about safety issues surrounding teflon material, I have some good news for you. New nonstick frying pans have progressed a lot. They can stand very high heat (most of them can be heated up to 500 degrees F, while most stir fried dishes require 400 F heat or less). They can coat with oil better and last a very long time. A frying pan can do what a wok cannot. Believe it or not, a frying pan actually can do more than a wok. 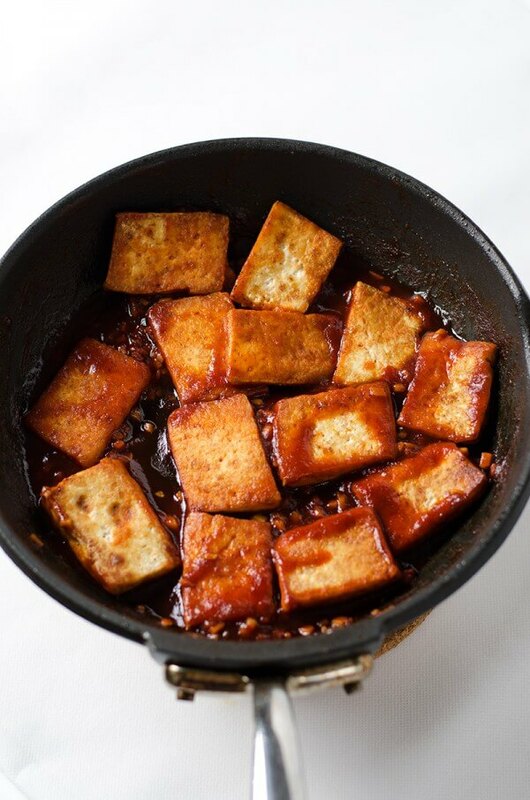 If you look at sweet and sour tofu or mapo tofu, you will find that a flat bottom pan can easily deal with tofu without breaking the pieces apart. You need to heat up a wok to very high heat no matter what dish you’re cooking, and cook it within a very short span of time to achieve good results. If you look at the real chefs who work in Chinese restaurants, you will be surprised that it only takes a few seconds to sear the meat or mix in the sauce (You will also be surprised at the huge amount of oil they use). 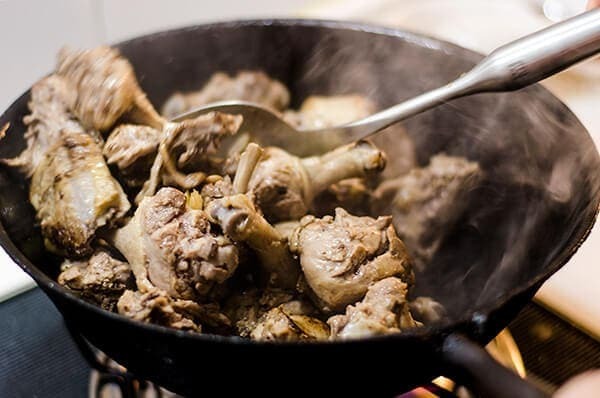 A frying pan will take more time (for example 30 seconds VS. 10 seconds) to completely cook meat/veggies and is thus easier for beginners to learn and get used to. If you’re not familiar with cooking with a wok, the temperature of the oil will quickly get too high to handle. Again, you have to be heat up the wok very well before cooking, even for some food that doesn’t require high heat. The heated wok will get out of control if you don’t adjust heat constantly, and most of it requires experience and is not listed in the recipe. The right way to heat up a traditional wok is on a gas stove top. A traditional round bottomed wok is not designed to cook on an electric stove top and you need to get a wok ring. However, a wok ring does not hold the wok as steadily as a flat one. Moreover, the wok will be too far away from the heat source, so the upper metal of the wok won’t heat up well enough. A flat wok is an alternative, but it requires more cooking oil and the upper third still won’t heat up so well. On the other hand, you don’t need a high power gas stove to cook with frying pan and it will heat up very well. Even a heavy frying pan is still lighter than a wok and can be easily cleaned up in a dishwasher. If you use a nonstick frying pan, you should not put it in a dishwasher, but it is much easier to clean because of its material. To clean a wok, you have to do it immediately after cooking, while it’s still hot. You cannot use detergent with a wok, and you cannot soak it in water (the cast iron will get rusty). If you accidentally burn the food or don’t clean up the wok on time, you’ll be in a lot of trouble. If you use a wok to cook stir fried dishes properly, it will get so smoky and will set off your fire alarm constantly. Unfortunately, there is not much you can do, because wok hei (“wok air” by direct translation) is the only reason a wok works and makes the food taste so good. Wok cooking is so smoky and smelly, which is why Chinese families don’t have open kitchens (we turn on the exhaust fan, open the kitchen window, close the kitchen door, and the living room still smells like a restaurant). Cooking with a wok every day in your big open kitchen will cause you to have to repaint the walls every 3 months and the connected rooms unlivable. No kidding. I admit, to stir fry with a frying pan generates smoke as well (in order to make better food). But the smoke is not as abundant as with a wok and you can use an exhaust fan to solve most the problem. A wok might be nice to have, as long as you like cooking Chinese food and want to prepare it authentically. It requires some practice and getting used to, but you will be amazed by the great smoky flavor of the stir fried dish that cooked with a wok. On the other hand, if you only cook Chinese food occasionally, only have electric stove at home, or want to use less oil in your cooking, I recommend you to invest in a high quality frying pan. Besides stir fry, a heavy bottomed frying pan could help make almost all your dishes taste better. Do you prefer to use a wok or a frying pan? Leave a comment below to share your experience with us! I just got into wok cooking and it is quite challenging! While it is fun to branch out and learn the new skills associated with it, I still have a long way to go. If I want to cook something predictably and consistently, I still go for the frying pan. If I want an uncertain outcome, some fun, and a bit of a workout (that thing is heavy! ), I’ll go for the wok. Lovely photos, by the way. They support your post beautifully. I agree, wok cooking is challenging and it’ll be nice to master the skill (I haven’t yet). It does handle more food than a flat skillet, so I still use it once in a while if I need to cook for more people. Maggie, this is a wonderful post! I have often wondered if I should make the investment in a traditional wok! Now I feel like I have a better grasp of the pros and cons! If I do get one, I would probably use it outdoors on the grill to keep my house livable! Hi Tracey, I’m so glad you found this one helpful! It’s a good idea to cook with wok outdoors. I think it’s quite as smoky as grilling. Lately I cook almost all the stir fried dishes with my nonstick frying pan. It’s just so convenient! 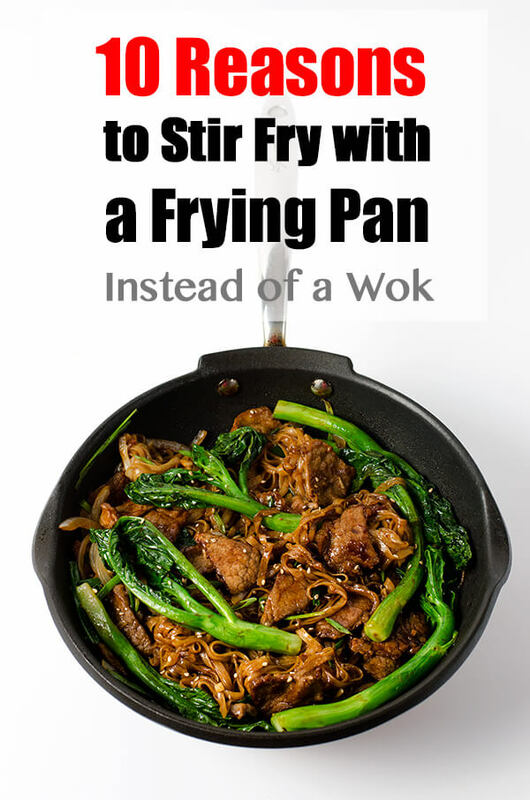 Yeah, I know it sounds a bit strange for me to write a post against using wok! I just feel so comfortable cooking with frying pan. I think stir fried dish is a bit challenging, if you need to cook for a bunch of people. I’m using a 10 inches skillet most of the time, cooking for two or three. I think a 12 or 14 inches one will be better if you need to cook for four. Both have there pro’s and con’s. But it’s not called stir frying when you use a frying pan, you are now sauteing the food. I have to disagree. Sautéing involves much less stirring than does stir-frying, as the veggies sit undisturbed in the pan for minutes at a time during sautéing to give them that savory brown edge. Stir-frying involves getting the crisp-cooked texture without the browning. The cooking method is not dependent on the utensil in this case. I suppose that is why you can do either or both on those large flat griddles. Hi Maggie! I actually bought a cheap non-stick wok some months ago and use it mostly for rice noodle dishes. Those high sides help keep mostly everything inside but I still end up with noodles and vegetables all over the stove top. I wanted to know which non-stick frying pan would you recommend? Hi David, I use a Cephalon nonstick skillet (12″) to cook my stir fried dishes most of the time. Well, comparing to traditional stir-fry that is cooked in a wok, my cooking is more like grilling and flipping (I love using a long pair of chopsticks to cook), with some gentle stirs. Otherwise the food will be all over the stove top. I cannot use the nonstick wok for stir-fry in my current place because I only have electric stove. The wok won’t generate enough heat for stir-fry due to its small bottom. Thanks for the advice. I did end up getting a pair of tongs so I’ve been a bit better at keeping the food in the wok! I thank you for this post. I have been using an electric skillet even though all the recipes call for a wok; I have been considering whether I should sacrifice the kitchen space for a wok, but after reading this, it seems like for an occasional Chinese cook like me the skillet is good ‘nuf. And then I opened my eyes amd read the above comment that answers my own question lol thanks again! It’s an almost daily companion, not only for stir fry but also for many other dishes. The glass lid allows me to just toss in the greens / veggies at the end for a quick steam. Only one pot to clean. Calphalon makes one just like it for the budget conscious who isn’t worried about what the non-stick is made out of. Hi David, I share the same problem after moving to the US. Now I have a portable gas stove that generates decent heat, and I can use my cast iron wok for stir fry to create very decent result. The cast iron wok works better than my carbon steel wok on this gas stove. And yes, I prefer to always stir fry a small amount of food all the time. It generates much better result. I also use my 12-inch carbon steel skillet to cook certain stir fry on my electric stove. It works well as long as I can lift the pan (the pan is very heavy) to toss the food. I end up saute the food instead of stir fry, but it’s way better than a under-heated wok. I’ve also try using the flat bottom cast iron wok on the electric stove, with no luck. No matter how long I preheat the wok (sometimes I over heat it), its temperature drops immediately when I added food, even a small amount. Thanks so much for responding so fast! 🙂 I love discussing this stuff. Despite my comments, woks are beautiful and are just aesthetically really fun to use. As you demonstrate, it can totally be done, just requires a bit more maneuvering. I will afterall probably use it a bit. 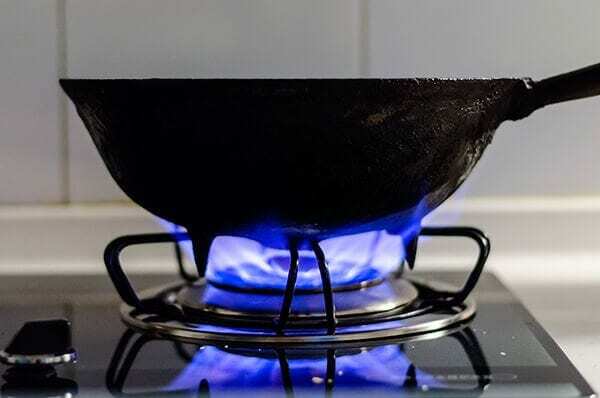 I recently read a similar article arguing that the usual unavailability of really high heat at home can be resolved by resort to a large frying pan or pot instead of a wok. I used my trusty large Le Creuset Dutch oven to stir fry a bunch of veggies on my gas stove and they turned out great. I first heated the Dutch oven on my “superburner” and then poured in a little over 2 TBS of corn oil before serially adding the veggies in the order in which they’d cook, and stirring only every minute or so. (I used celery, red pepper, green and red onions, asparagus, zucchini, a stalk of kale, about a TBS of fresh Italian/Chinese parsley, and one of those plastic containers of shredded broccoli, cabbage, and carrots that are easy to find marked down in the produce dept.) I added the broth at then end but skipped adding the usual cornstarch roux, and it wasn’t missed. The broth was a mixture of the liquid from a 28 oz. can of Mexican carrots w/ jalapenos, from a 14 oz. can of ‘shrooms and from a regular can of chicken noodle soup, spiced up w/ some ginger, lo-so soy sauce, black bean sauce, basil, and ginger. Needless to say, I did NOT add any more salt. The combination worked very well and since I used a lot of fast-ripening veggies, the proportions were about right, if perhaps a bit too liquidy. Easy to solve that by reducing the liquids next time, but the flavors turned out well and it went perfectly over steamed rice. And the “innards” of the chicken noodle soup? They went into the mix at the very end, the noodles making for a nice addition to it all. Thanks for sharing your experience Mike! I agree with you, it is very difficult to generate high heat at home even with a gas range. After moving to the US, I start to use heavy carbon steel fry pan and cast iron deep skillet to cook stir fries, and the food always turns out great. The heating mechanism changes because you’re “grilling” the food instead of using “wok air” and “sear”, and will lose smokiness, but that is a trade off for cooking with a less powerful stove. The food will still taste good. Chicken innards are the best! Sometimes I simply salt and pepper them and roast them in the pan with a bit wine. Great idea to add them into stir fried veggies. That sounds so delicious! I have a wonderful Chef Fai Lee recipe for Chicken Asparagus in Oyster Sauce Stir Fry which I have made with the wok for us and the larger CI pan for company.. Both were very good but, I do believe that we liked the wok made stir fry better.. I like your post on fry pan vs. wok. Yet I wonder what happens when you need to cook for a family a stir and fry meal? Most of the frying pans are to shallow to prepare food for more than 2 people. At the moment I am looking into buying a wok. One of the woks that I consider to buy is lodge pro logic cast iron wok. It has round bottom for cooking but the part that seats on the stove is flat so you can use it on electric stove. The big cons on the reviews are its weight, so basically no flipping (Is that important?) and that it takes longer time to reach working temperature. Did you hear about this wok? What is your opinion on using a cast iron wok? Hi Ariel, this is one tricky question to answer. The sad fact is, I’ve never seen a pan that is large enough to cook for four or more people. Back in China, my mom would make two stir fried dishes for our family of three. The best you can do is buy a large wok, which generates about 3 to 4 servings for dishes that contains one protein and vegetables, or 2 to 3 servings if you’re cooking fried noodles or fried rice. Most Chinese cookbooks will recommend cook less than 12 ounces meat at a time, even with a wok. I’ve tried with one pound meat and that is already pushing limit. One solution is stir fry food in smaller batches, and mix them with the stir fry sauce in the end. The other option is to cook two dishes, for example, one protein serving as main, and a vegetable side (which usually takes 2 to 3 minutes to cook). To answer your question about the wok, I wouldn’t recommend the lodge cast iron wok if you are using electric stove. I own that wok and love it when cooking over gas stove. But it takes forever to heat up over an electric stove, and you could easily overheat (or underheat) it. When I add food, the pan temperature drops immediately and takes too long to get hot again. The problem is, that wok has a small bottom that only fit the smaller heat element on my stove. It’s definitely not hot enough for making stir fries. My current favorite stir fry pan is the carbon steel Debuyer deep skillet: http://amzn.to/2gbkPIt (I own a few woks by the way, just for testing and experiments). It has a bottom that is large enough to fit the large heat element, so it heats up much faster. The pan is also heavy, which holds heat better, but still lighter than the cast iron pan (5 lbs vs. 10 lbs). It’s slightly easier to handle. You don’t need to move the pan while cooking, but you still need to clean it while it’s hot (both cast iron and carbon steel require special care). You need to put on oven mitts while dealing with the cast iron pan and it can be quite a bit workout. There is no perfect solution. Hopefully you’re able pick one that works for you! Hi Maggie, Thanks for the fast response and explanation. I looked into your recommendation, De Buyer deep pan. Since it is made of carbon steel, How did you season it? How do you maintain this pan? Do you use metal wok turner when you cook with that pan? Does tossing food while you cooking gives anything to the food? I know that I ask lots of questions. But as they say where I come from “I have learned from all my teachers”. Thanks again and happy holidays. – Season the pan: I use hot water and a scrub to wash the pan thoroughly first. To season the pan, rub with a thin layer of oil, then heat it up on stove until the oil just to smoke. Kept it on the stove for another 30 to 40 seconds, then remove it from the stove to cool. Once the pan is completely cooled down, I repeat the process a few times until the bottom turns brown. 3 times will be enough to start using the pan, but 5 to 6 times will make the pan even better. – Maintain: rinse the pan with hot water and scrub with a brush after cooking. Dry thoroughly with towel (sometimes I also put the pan back to the hot burner for a few minutes, to make sure it’s dried). Then rub a thin layer of oil with paper towel. – Spatula: I usually use my silicon spatula (a metal spatula might damage the seasoning if it’s a new pan) and sometimes the metal spatula. Both has long handle and edges on the sides of the spatula to help you transfer the food. – Tossing food: it’s just a way to cook the food evenly and make sure the season is evenly distributed. It can be accomplish by tossing the pan, tossing with a spatula or a pair of tongs (for noodles). On the other hand, tossing (especially pan tossing) will drop the pan temperature, especially when you add a lot of raw ingredients. So use it moderately. Hi Fred, I use the gas burner when I test my stir fry recipes or whenever I cook for friends or a party. I rarely set it up for weekday dinner, because it’s a bit too consuming for me. I would give it a permanent space in my kitchen if I have enough space. Re portable induction burners – I wouldn’t use it because you can not adjust the heat as fast as gas burner. Plus you still need to use a flat bottom skillet. Unless your wok has a large enough bottom, it still won’t generate high heat fast enough to heat up the whole pan. Re multi-metal All-Clad: if the it has nonstick coating, then you actually can use it on an electric stove for cooking small servings, because you cannot heat it up too high anyway (it will damage the coating). For all-clad stainless steel, I wouldn’t recommend it for Chinese style stir fry. Because you always use cornstarch to marinate the meat and making sauce, which will stick to the pan no matter how well you heat it up. As for material, cast iron and carbon steel are the top choices when you want to use super high heat with a nonstick surface. Carbon steel wok is lighter than cast iron one, so many Chinese restaurant use the carbon steel round bottom wok as a top choice which allows them to toss the food. For me, I use both carbon steel pan and a deep skillet (almost like round bottom wok) because they are slightly lighter than my cast iron pan, and heavy enough to hold heat well. On the other hand, I wouldn’t mind using a nonstick skillet for a quick stir fry (depends on the dish I cook), because it can be just as efficient. Finally, I always judge my pan (or wok) by its weight and I always prefer a heavier pan no matter what material it’s made from. 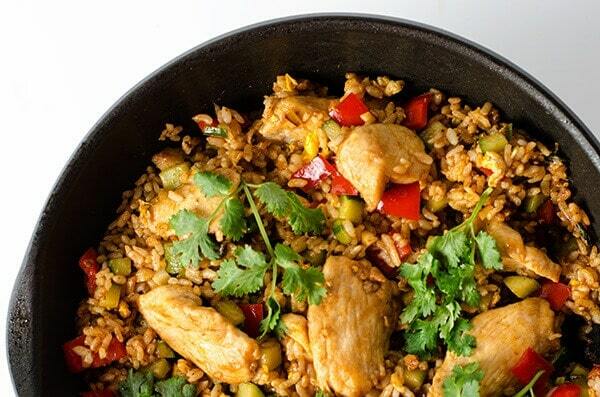 The heavier the pan, it holds heat better and make tastier food. I do use a heavy duty carbon steel flat bottom wok sometimes when I do some serious cook. It can heat up a bit hotter than the nonstick, but heavy to handle. I hope I can find a good nonstick wok soon! For me 2 main cons of a wok that you mentioned – smoke that sets up alarm and make apartment smell like a restaurant, and storing/cleaning headache. However there are some pros that I like – you can use a wok for deep frying and steaming, so with some skill a wok will become quite multifunctional. Great article – I do see how frying pan for just stir frying is plainly so much less hassle. I must say that, reading through this post, I was not convinced! Thinking about it, however, I’ve read before that home stoves do not reach the temperature necessary for great stir-frying. This is where I also believe a problem with the hard anodised non-stick lies: it just overheats too easily. So there seems to be no easy way out! (1) use a heavy-duty nonstick pan, so it builds up the heat slowly and holds heat well without overheating easily. (2) I also own a heavy-duty carbon still pan. It develops the patina over time and becomes nonstick. It’s by far the best tool to stir-fry using a home stoves and sears food beautifully. It is quite heavy, but not as heavy as a cast iron pan. After many attempt to season my carbon steel wok correctly, use it on my electric stove, and keep food from sticking, I decided life is too short for that. I now use a TFAL 12″ skillet on an induction plate. SUPER! Less oil, great searing at high temps, with great color and flavor in the vegetables. TFAL heavy bottom skillets will handle very high temps and induction gives you the control not present with electric coils. Great results. Using a carbon steel wok on an electric stove had been a disaster for me. Now I use a heavy duty carbon steel skillet when I want to sear meat, and I use my nonstick skillet for stir frying most of the time. Thanks for your response. Another option: I recently acquired a ceramic coated induction ready wok which works at high temperatures on the induction hob and is good for folks who might be trying to get by with a bit less oil (and smoke).. Now that the weather is better here in Seattle, I have used my carbon steel wok outside on the propane burner, where it works best.If I use it enough out there (before the rain sets in again) I will finally get it seasoned properly. Wow I’ve never considered a ceramic coated wok! Didn’t even know it exists. Just briefly checked the review on Amazon and it looks great. Maybe it’s the ultimate answer to indoor stir fry 🙂 I’m sure it works better on an induction burner than the electric. But nonetheless I’d love to give it a try. Oh yes using carbon steel wok outdoor is the best way. Hopefully I’ll able to do that setup after we move to a bigger place. Re season the wok, I always rub a very thin layer of oil after you clean and dry the wok once finish cooking, then heat it briefly on the stove. It helps to speed up the seasoning. Eventually when the wok turns to a beautiful black color you can stop this step. Wow, This is so interesting. I use stir fry to for cook my food. It is really necessary to cook my food. I use this for a couple of month. Thanks of share this resourceful article. Thanks for your content. I am so confused to buy Carbon steel wok. Then I am confident to buy this product. Waiting for other resources. I simply got into cooking pan change of state and it’s quite challenging! I make sure preheating my pan over medium heat for a minute before adding in any oil. Thanks . This article seems to have been written and commented upon about 2014. Three years later, I run across it and I guess I am the exception. I started using a wok as my main and my only pan in college. I had no idea what I was doing but it seemed to handle everything I needed to cook. It was a soup pot, a steamer, a frying pan, a smoker, and so on. I learned more as I got older and as I learned more, I respected woks and wok cooking more and more. I use and love several woks but my main pan is a 14″ carbon steel. It along with a 3 quart pot and a pressure cooker are really all I need in the kitchen to make wonderful meals. I make crepes, soups, stir fry, oven roasted chicken, omelets, fried anything, deserts, and so much more in my wok. I can see the reason to recommend a skillet to beginners but if you use – and I mean really use a wok like the Chinese rural population does, it can be about the only tool you need. When my husband and I were dating, 28 years ago, we saw an ad for a wok from China. It is not made of cast iron, but a thin metal. It was our first purchase together. We have used it all these years on a gas stove and have enjoyed the results, but I agree that it takes a lot of oil to do fried rice. It came with utensils but we have since purchased better quality ones. I’m intrigued by the frying pan method and may give it a try. Thank you so much for the information! I just purchased a small nonstick fry pan, the first ever, and am amazed at how wonderful it is to cook in. I am excited modern Chinese cooking. there are many recipe. Highly value and appreciate this candid perspective born from experience, skills and most of all, credibility given your Chinese upbringing. I absolutely love authentic Chinese stir fry. Despite being passionate about food preparation and cooking, and having these skills, your article has led me to change my plan to purchase and attempt stir frying via wok. I’ll stick to what I know/ do well. And get my stir fry from the experts — local Chinese restaurant chefs! In the process, avoid the excessive oil and smoke. Thanks much! Looks Delicious! Thanks for sharing your tips. I get more ideas from it. I love wok and am looking for best wok to buy. Thanks again for this post, you confirmed my initial thoughts about the newer generation of PFOA-free non stick pans. I have ultra conservatives trying to tell me otherwise regarding chinese stir frying and cooking with high heat. Stir fry using a large wok is easier and produce better-tasting food. Sauting with a frying pan means you have to careful not to push the food outside the pan. With a large wok, you can relax and don’t need to worry. Traditional stir frying involve a shevel-like spetula that turns food up side down often, which sauting cannot do. The large amount of motion of stir frying makes food evenly-coated with oil and evenly cooked. The stir-fried dishes definitely taste better than non-stir fried ones , which I think most Chinese cook would agree. I appreciate your article, I wanted a wok & now I don’t, you saved me time & $. I realize for my needs, I really don’t need one ! Thank you !